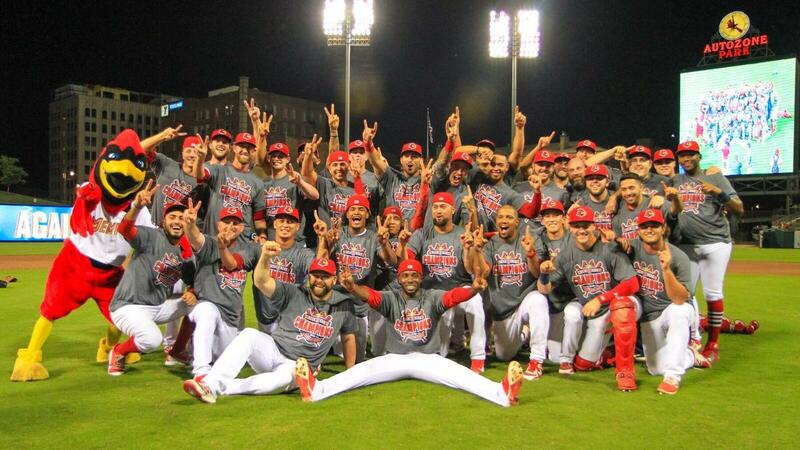 MEMPHIS, Tennessee - The Memphis Redbirds (3-1) used dominant pitching and two homers to win the 2018 Pacific Coast League Championship Series, topping the Fresno Grizzlies (Houston) 5-0, Saturday night at AutoZone Park. The 'Birds won the title 18 years to the date after they won their first PCL title in 2000. Unlike their first three home games of the postseason, the Redbirds did not need any late inning heroics in this game. Outfielder Randy Arozarena was phenomenal at the plate and in the field for Memphis. The speedy outfielder smoked a three-run home run in the first inning to put Memphis ahead for good. Later in the game, he made an outstanding diving play in the outfield to rob a Fresno batter of an extra-base hit. Arozarena then hit a two-run home run in the eighth inning to deliver the final blow. Starter Jake Woodford was outstanding in the game. The right-hander threw 7.1 shutout innings, completely dominating the Fresno hitters. He allowed just three hits and one walk, while striking out six batters. After allowing one hit in both the first and third innings, Woodford was basically untouchable. After the single in the third, he retired 15 of the next 16 batters he faced, allowing just a single walk in that span. At one point, he retired 12-straight batters before allowing a one-out single in the eighth. Arozarena and infielder Tommy Edman were named co-MVPs of the PCL Playoffs. After his performance tonight, in seven postseason games, Arozarena hit .348 (8-for-23), scoring five times, hitting a double, two home runs, and driving in seven runs. Edman appeared in all eight games, hitting .469 (15-for-32), scoring six times, hitting three doubles, one home run, and driving in six runs. With the win, Memphis secured its second-straight PCL title and fourth in franchise history, joining 2000, 2009, and 2017. They are the first team since Omaha (2013-14) to win back-to-back PCL Championships. Manager Stubby Clapp has now managed or played for three of Memphis' four champion teams. He was on the team in 2000 when they won their first PCL Championship, and has now guided Memphis to back-to-back titles as manager. Memphis won the title, despite massive roster turnover. A franchise record 66 different players appeared on the Memphis roster this season. Six of them were promoted from Memphis to make their Major League debuts, and 18 total Redbirds appeared with St. Louis at some point throughout the season. 22 of the players who appeared with Memphis this season were making their Triple-A debuts. The Redbirds found success once again, despite having a very different playoff roster from last season. Only three active players from last season are still on the roster. Wilfredo Tovar and Edman remain for position players, and only Kevin Herget remains for pitchers. From Memphis' 25-man, Opening Day roster, only nine players remain, six position players and three pitchers. The Redbirds went 83-57 in the regular-season after going 91-50 in 2017. Their 174 wins between the last two regular seasons are the most for a Memphis pro team since winning 174 games in 1933-34. The Redbirds are now the first Memphis pro team to win back-to-back championships since the Memphis Chickasaws of the Southern Association won consecutive titles from 1952-53. Memphis will now travel to Columbus, Ohio to play the Durham Bulls (Tampa Bay) in The Triple-A National Championship Game. The game will be Tuesday night at Huntington Park, and will be televised on NBC Sports Network.